Scott joined Lewinsville as Interim Pastor in August 2015 and became Pastor September 2018. Scott came to us from Germonds Presbyterian Church in New City, Rockland County, north of New York City, where he was pastor from 2008 through July 2015. Scott served in the National Capital Presbytery from 1998-2006 at First Presbyterian Church of Arlington, first as Interim Director of Program Ministries and then as Associate Pastor from 1999-2006. He was the Interim Pastor at North Congregational Church (UCC) in Middletown, NY, for a year between his service at First Arlington and Germonds. Scott was first brought to Lewinsville’s attention by General Presbyter (and former Moderator of the General Assembly) Dr. Susan Andrews, who maintains close family ties with Lewinsville. She offered highest praise for Scott’s transformative pastoral skills and energetic, creative leadership in the life of the presbytery. Scott’s wife, the Rev. Laura Cunningham, is the Pastor at Western Presbyterian Church in Washington. They have two children: Will and Ginny, and they live in the Dominion Hills neighborhood of Arlington. Scott is a native South Carolinian. As an undergraduate he attended Princeton University. He received his Masters of Divinity degree in 1998 from Columbia Theological Seminary in Decatur, Georgia where he is currently pursuing a Doctor of Ministry degree in Christian Spirituality. Scott is an avid reader, movie-goer, and country-music “connoisseur.” Scott enjoys playing tennis and has been known to attempt to play golf. The newest member of the Lewinsville professional staff is Rev. Annamarie Groenenboom, who was called in September 2018 to serve as Stated Supply Pastor for Youth Ministries. The Michigan native earned her Master of Social Work degree from the University of Pittsburgh in 2017. She also received a Master of Divinity degree from Pittsburgh Theological Seminary the same year. While completing her seminary studies, she served as Director of Children and Youth Ministry at Glenshaw Presbyterian, Glenshaw, Pennsylvania. In August 2017, Annamarie was called as pastor of the Plum Creek Presbyterian Church, and ordained at this rural church in January 2018. Altogether, she served the Plum Creek congregation for nearly a year before moving with her husband, Mitch, to the Washington area in the summer of 2018. In addition to being an ordained pastor, she was licensed in Pennsylvania as a psychiatric social worker. Rev. Jen Dunfee joins the Lewinsville staff on April 1, 2019, to assume responsibilities for Care Ministries. She may be a familiar face, because she and her family, husband Andrew and children Acadia, Thomas and Anabel, worship at Lewinsville. Jen has preached, been on the prayer team for healing services, led a family worship service and all-church retreat session for kids, served on the youth minister search committee and plays on the Lewinsville sluggers softball team. Jen has been a minister member of this Presbytery for over a decade, serving the Clifton Presbyterian Church as the associate pastor for youth and families and her most recent call as the Chaplain of the National Presbyterian School. A large part of Jen’s work at the school involved the pastoral care of the community, direct pastoral care for kids, teachers and families, coordinating the community’s care response in times of loss or transition, and providing pastoral services such as funerals and baby blessings. While in Seminary, Jen’s yearlong supervised ministry was not church-based but in a skilled care nursing facility, so she brings experience in pastoral care throughout the life cycle, supporting and equipping care-givers, and coordinating systems of care. Jen is a graduate of Duke University and Yale Divinity School. She grew up in Cherry Hill, New Jersey. Jen and Andrew and children live on the campus of The Madeira School, where Andrew is chair of the History Department. John joined Lewinsville in June 2018 after receiving his Master of Music in Organ Performance from the Eastman School of Music in Rochester, New York. A native of Fairfax County, John received his undergraduate degree, also in organ performance, from the Jacobs School of Music at Indiana University. In addition to being the church’s principal musician, John will direct all of Lewinsville’s vocal choirs. A former student of Dr. Edward Moore, John was the first prize winner of the National Federation of Music Clubs Student Collegiate Organ Competition in 2017. John has performed on the organ in churches and cathedrals across the United States and in the UK, and he recently served as music minister at a large church in Webster, NY while completing his master’s degree. Allison joined the staff at Lewinsville in November 2003 from Second Presbyterian Church in Knoxville, Tennessee, where she worked for five years as Director of Children’s Ministries. Prior to her work at Second Church, Allison worked for 16 years as the Director of Christian Education at First Presbyterian Church in Gastonia, North Carolina. Allison was raised in Bethesda, Maryland, and was a member at Bradley Hills Presbyterian Church where her parents are still members. Laura Hinton joined the Lewinsville music family in 2007 as the Children’s and Youth Handbell Director. Her role evolved over time, and now she is the Director of Handbells, leading bell choirs for ringers of all ages 3rd grade to adult. Laura has previous experience directing choirs at Warrenton United Methodist Church and Burke United Methodist Church. Laura has been ringing in and/or directing handbell choirs since her home church bought its first set of handbells in the 1970’s! In addition to handbells, Laura’s hobbies include playing the flute, knitting and gardening. Her Monday through Friday job finds her at The MITRE Cororation in McLean, where she is a Systems Engineer. She and her husband Mike live in Warrenton and have three children; Theresa, Alex, and Stephen. Laura Marchisotto Bogart, Assistant Musician (piano and organ), rejoined Lewinsville in December 2014, having served in the same capacity as interim in 2004. Throughout she accompanied the childrens’ choirs as a volunteer from 1996 through 2007. Previously, for 8 years she served the Beverly Hills Church in Alexandria as both organist and choir director. Laura has been on the music staff of several regional and national opera companies and universities; in addition to her collaborative duties she taught French and Italian diction. In 1999 she was appointed to the music faculty at The George Washington University, where, for 10 years she served as Assistant Conductor/Accompanist to the University Singers, the department’s mixed chorus, accompanied faculty and students and taught piano. In addition to her work at Lewinsville she teaches piano at her independent music studio, pianopartnermclean.com. Bob Clark joined the staff on a part-time basis as Church Administrator in 2016, helping to fill an administrative gap at the church. Bob will be focusing his efforts on administration issues related to the facility and property, and he will be working closely with Jeanne Melone, whose title has been changed to Financial Manager to reflect some additional responsibilities she has been given. In general, property-related questions can be directed to Bob and finance-related questions can be directed to Jeanne. Bob and Jeanne are a great team! Jeanne, (pronounced Shăn), is a native of Copenhagen, Denmark. She completed a one year program in banking and accounting at Handelsskolen business school before she was hired by a Copenhagen bank. While working, she continued her education, earning a three-year degree in international banking. When she moved to the USA, she worked mostly part time for several banks, including First Market Bank in Williamsburg where she was soon promoted to Assistant Branch Manager. She became skilled in the Quick Books computer program and, in 2008, managed bookkeeping duties for two small Williamsburg businesses. Jeanne is married to the Rev. 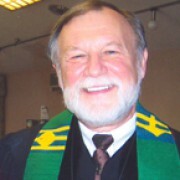 Dr. Robert Melone, Jr., pastor of Mount Vernon Presbyterian Church. Their three grown children are Stefan, Jacob and Kirsten. Jeanne enjoys knitting, quilting, gardening, and travel. Sandy joined Lewinsville’s staff in 2001, after spending 15 years at the Central Intelligence Agency. As Office Manager at Lewinsville, her skills are spread across a wide range of responsibilities. In addition to serving as chief receptionist, she is responsible for the production of all church publications from weekly bulletins, monthly newsletters to annual reports and more. She maintains the church membership database and provides administrative support for Session, the Clerk, pastors, and all ministry groups. When she’s not attending to Lewinsville duties, she enjoys spending time with family, especially granddaughter, Violet. Steve joined the staff of Lewinsville in 2008. For the ten years immediately preceding, he served in a similar capacity at The Falls Church. At Lewinsville, he began as Night Sexton, but his duties evolved to include oversight of the entire physical plant. As Facilities Manager, Steve is the “go to” problem solver on the church staff. He is a native of the District of Columbia whose professional career has always been in Northern Virginia. The Rev. Dr. Susan Kendall is director of the Doctor of Ministry Program and a member of the faculty at Pittsburg Theological Seminary. Kendall’s interests are focused on the intersection between theology and culture, with a particular study of spirituality and religious tradition. She received her Ph.D. from Claremont Graduate University School of Religion, Program of Theology/Ethics and Culture in 2004, and continues her relationship with Lewinsville as a Parish Associate. Rev. Pinder served Lewinsville Church for 37 years, from 1968 through 2005. Gary’s tenure included several milestones in mission growth and outreach for the church. As part of an outreach program to the local community, Lewinsville Church opened a 144-unit retirement home for the elderly in 1980 on land immediately adjacent to the church. During the 1980s, he shepherded the membership through a $2.5 million renovation and expansion of the sanctuary and physical plant. In 2003, he was instrumental in starting the “Journey for Discernment,” an effort by the church to redefine its mission. From Rochester, New York, Gary is a graduate of the College of Wooster and Pittsburgh Theological Seminary. He and wife Barbara reside in Maine.